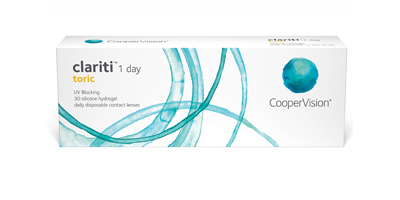 Clariti 1 Day Toric for patients with astigmatism, providing stable consistent vision which allows more oxygen to the cornea compared to hydrogel contact lenses, helping promote ocular health. CooperVisionspatented AquaGen, technology ensures the lens stay moist and wet during long hours of wear, reducing discomfort towards the end of the day. Advanced Edge Technolog provides a lens edge that is incredibly thin making it feel like you are not even wearing a contact lens. Clariti 1 Day Toric disposables feature UV blocking to protect the eyes from the harmful effects of sun rays. 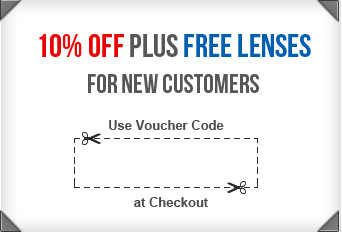 The exclusive Aspheric Optic design reduces spherical aberration over a range of powers – which means exceptional vision all day, and especially in low light. Aspheric back surface and blended edge design Optimises lens movement on the eye and Minimises lens / conjunctival interactions.